The Big Question: Whats the Big fish doing in the pond ?? Right from the dawn of time, the presence of non-ASEAN countries has always been like a spaceship loitering like a UFO in an another planet’s orbit covering the sun for a bit. The real question — do the ASEAN countries feel that they don’t have the potential enough to figure out their own issues — OR — is it a situation where they feel it is best that the big guns decide because they have been through the process? After attending the session in the final half of the send day at the HNMUN 2015, Agence France-Presse bore witness to discussion on the working papers. Delegates from the UK, Singapore, and Thailand were against questions. They talked about the reediness for disastrous situations, warning systems for hurricanes tsunamis, and not panic in such situations depending on their geographical location such as helping disabled people evacuate the affected areas. 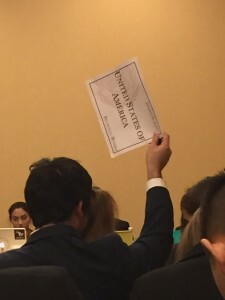 The delegation of the UK came up with a resolution of adding the non-ASEAN nations together and helping to raise funds that can be put to immediate use at the time of disaster. The delegation of Singapore supported the UK and alliance to take support from the UK. In a personal interview, the UK claims to have the potential to hemp developing nations and to aid them financially. It is more or less likely that more than 50 percent of natural calamities occur in a non-patternic fashion. Countries who have extensive experience detailing with certain disasters — think, for example, Japan and earthquakes — should be the sole sources of knowledge and information on how t best respond to these specific natural disasters. 1) Countries have to decide themselves in ASEAN whether they are ready to accept ideas from countries who don’t share their geographic location and have fewer ideas about the reaction of people during threatening times and have no idea about the loss of life, economic crisis of the country on the receiving end. 2) It is also very ironic when the Creator questions his own creation. Forcing aid to any nation is a policy pursued by many larger countries that should be thoroughly reexamined through an imperial lens before being officially approved by any United Nations body. The United States, the worst of the big fish offenders, attempting to overpower smaller countries.